Fridge Filterz FFWP-301-2 cyst filter (Standard 42 & 53) 2 Pack replacement water filter is designed to fit selected Whirlpool*, KitchenAid* & Kenmore* Front Grille 1/4 turn style refrigerators. This premium water filter is designed to remove sediment, Chlorine Taste and Odour as well as contaminants and heavy metals including Lead, Mercury, Lindane, 2-4-D, atrazine and benzene, to name a few, that may be present in your drinking water. This refrigerator filter replaces: Whirlpool* Filter 439651 4396164, 4396548, & 4392922 KitchenAid* Filter 4396163, 4396547 & 8212491 - Kenmore* Filter 46-9010, 9010. The FFWP-301-2 is tested to meet NSF/ANSI Standard 42 & 53, Particulate Class I, to ensure that you are getting a SAFE, quality product. Fridge Filterz are manufactured to the highest quality standard, providing you and your family with clean, fresh tasting, odour free ice and water without removing beneficial minerals and fluoride that may be present in your drinking water. 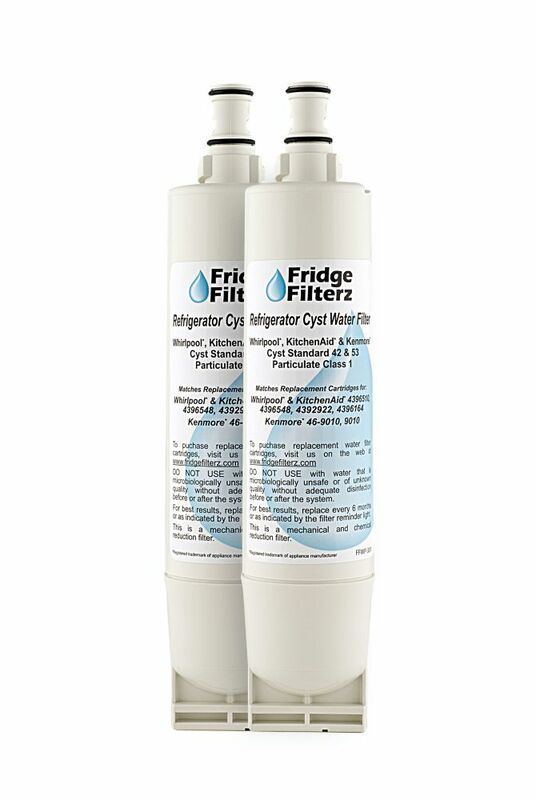 FFWP-301 Replacement Refrigerator Water & Ice Filter (2-Pack) Fridge Filterz FFWP-301-2 cyst filter (Standard 42 & 53) 2 Pack replacement water filter is designed to fit selected Whirlpool*, KitchenAid* & Kenmore* Front Grille 1/4 turn style refrigerators. This premium water filter is designed to remove sediment, Chlorine Taste and Odour as well as contaminants and heavy metals including Lead, Mercury, Lindane, 2-4-D, atrazine and benzene, to name a few, that may be present in your drinking water. This refrigerator filter replaces: Whirlpool* Filter 439651 4396164, 4396548, & 4392922 KitchenAid* Filter 4396163, 4396547 & 8212491 - Kenmore* Filter 46-9010, 9010. The FFWP-301-2 is tested to meet NSF/ANSI Standard 42 & 53, Particulate Class I, to ensure that you are getting a SAFE, quality product. Fridge Filterz are manufactured to the highest quality standard, providing you and your family with clean, fresh tasting, odour free ice and water without removing beneficial minerals and fluoride that may be present in your drinking water.